WASHINGTON – Today, Ryan Zinke (pronounced Zink-EE) was confirmed and sworn in as the 52nd Secretary of the Interior. The Senate voted 68-31 to confirm Zinke the morning of March 1, 2017, and he was sworn in by Vice President Mike Pence at a ceremony in the Eisenhower Executive Office Building later that evening. Zinke is the first Montanan to serve as a cabinet secretary and also the first U.S. Navy SEAL in the cabinet. (Greeley, CO) – (03/01/2017) – The U.S. Department of Agriculture (USDA) Farm Service Agency (FSA) Executive Director Jeff Wilson in Weld County announced that Conservation Reserve Program (CRP) participants need to perform mid-contract management activities by March 14th for crop year 2017. The March 14th deadline is for producers who are inter-seeding or lightly tilling their CRP contract acreage to improve plant diversity, which will enhance the wildlife habitat. The primary reason for CRP is to reduce and eliminate air and water pollution through the planting of permanent grass cover on retired cropland. (Greeley, CO) – (03/01/2017) – The U.S. Department of Agriculture (USDA) Farm Service Agency (FSA) Executive Director Jeff Wilson in Weld County announced that farmers and ranchers in Colorado need to enroll their farms into the Ag Risk Coverage and Price Loss Coverage contracts for crop year 2017. The deadline to enroll is August 1st annually, but now is the time to visit FSA and review files and initiate contracts. Producers who have not enrolled for crop year 2017 are encouraged to do so now. Please call the Weld County FSA to set up an appointment at (970) 356-8097 extension 2. WASHINGTON, Feb. 27, 2017 — In response to a request from Jenny Peterson, Farm Service Agency’s (FSA) acting State Executive Director in Colorado, the U.S. Department of Agriculture (USDA) has designated Baca, Elbert, Lincoln and Weld counties in Colorado as primary natural disaster areas due to losses and damages caused by a recent drought. That’s the theme of Agricultural Safety Awareness Program Week, March 5-11. The U.S. Agricultural Safety and Health Centers are joining the National Farm Bureau Federation in urging respect for the safety spaces around hazardous farm equipment and tasks. Grain bins, grain wagons, manure pits, tractor seats and livestock flight zones are all ‘spaces’ on agricultural operations that require caution. It is easy to take these spaces for granted when you work near them every day, but it only takes a split-second for disaster to occur. Fort Collins, CO – Roads and bridges that are deteriorated, congested or lack some desirable safety features cost Colorado motorists a total of $6.8 billion statewide annually – $1,396 per driver in the Northern Colorado area – due to higher vehicle operating costs, traffic crashes and congestion-related delays. Increased investment in transportation improvements at the local, state and federal levels could relieve traffic congestion, improve road, bridge and transit conditions, boost safety, and support long-term economic growth in Colorado, according to a new report released today by TRIP, a Washington, DC based national transportation organization. RESEARCH TRIANGLE PARK, N.C., USA, March 1, 2017 – Digital agriculture — a term that’s used increasingly — means something different depending on which agricultural company or employee is asked. Some say it’s all about data. Others say it’s about precision agriculture. At Syngenta, digital agriculture means turning data into meaningful information that farmers use to run their operations more productively and profitably, provide sustainability performance downstream, and protect their resources including soil, water and biodiversity. Colorado State University Extension is always looking for ways to bring education and new ideas to our clients. With this in mind, the Extension Office in Pueblo County has put together an amazing tour of the Andalusian region of Spain. The tour will include learning about olive oil production, greenhouse vegetable product, cotton cooperatives, crop diversification, and equine and cattle operations. And of course there will be time to explore the local culture through dinners, gardens, architecture, and entertainment. The trip will be November 26 through December 8, 2017. Tour Pricing : $3,865 USD, Based on double occupancy. Single Supplement: $525 USD. Final payment due September 15, 2017. Hurry! Space is limited to 24 participants. This tour will sell out. BROOMFIELD, Colo. – Each month, the Colorado Department of Agriculture features a different product to highlight the variety and quality of products grown, raised or processed in the state. Colorado is the number one millet producing state in the nation, with 260,000 acres producing more than 8 million bushels each year. What’s Millet? Millet is a grain that is most often found in bird seed blends; however, this gluten-free grain is also gaining popularity in many recipes. 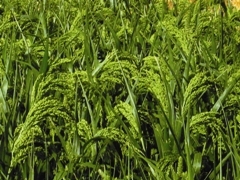 Look for Colorado millet at your local grocery store or on the menu at restaurants across the state. U.S. Farmers & Ranchers Alliance® (USFRA®) partners with Discovery Education to launch Digital Exploration and Interactive Lesson Plans to show students where their food comes from. Respecting the past, driving towards the future. The American National CattleWomen, Inc., is proud to unveil its new logo, designed to represent the past, present, and future of ANCW. “Since taking on the logo project, it was clear to me the organization was looking for something that combined the traditions of our history, with a modern outlook of our future endeavors. The previous logo, as it was, only symbolized our past, not our future,” said Cheyenne Sparks of Oklahoma. The new logo itself has the time-honored cowbell, ghosted in the background, respecting the roots of the organization and acknowledging those local and state groups who continue to use Cowbelle as part of their name. However, in reference to the present and future of ANCW, the shape of the cowbell was modernized. Growth Energy condemed the effort of Carl Icahn (Eye’-kahn), the owner of CVR Refining, to strike a backroom deal with the Renewable Fuels Association that would change the Renewable Fuels Standard by shifting the point of obligation from refiners to fuel retailers. Emily Skor, CEO of Growth Energy, said, “If this is true, this proposal would undo all of America’s progress under the RFS and impose massive costs on consumers.” She says both sides in that “deal” don’t have the authority to come to an agreement. “Mr. Icahn doesn’t work for the government, but instead owns CVR Refining, which would profit directly from such a deal. The RFA also doesn’t represent a majority in the biofuels industry. Their largest member is a refiner that would also profit from the deal,” Skor said. She says both of those companies are negotiating for the same side, which Skor says isn’t the American farmer or the ethanol industry. “In exchange for his company getting a waiver from its responsibility,” Skor said, “Mr. Icahn promised support for a Reid Vapor Pressure (RVP) waiver from the Environmental Protection Agency. That’s a change that already has strong bipartisan support as a common sense solution to increase summer sales of higher ethanol blends.” However, a Twitter post from Amy Harder of the Wall Street Journal said the White House denies those comments by Dineen, as a White House Spokewoman says no executive order on ethanol exists. The Trump White House appointed Ray Starling to the position of Special Assistant to the President for Agriculture, Trade, and Food Aid, a move hailed by multiple Ag groups as a positive. Starling was most recently an aid to North Carolina Republican Senator Thom Tillis. Starling’s appointment fills a position left mostly vacant during the Obama Administration. A National Pork Producer’s Council release called Starling a “true champion for American Agriculture,” adding that his appointment signals a clear intention by the Trump Administration to undo some of the unnecessary regulations that are making it hard for pork producers and all American farmers to do their jobs. The special assistant position is part of the National Economic Council and Farm Bureau President Zippy Duvall said Starling is a great choice. “Mr. Starling not only knows agriculture from his farm background, he’s also an accomplished Ag policy specialist. We look forward to working with him as he advises the president,” Duvall said. The National Cattlemen’s Beef Association and the National Cotton Council also issued releases praising Starling as a good addition to the National Economic Council. Farm financial liquidity describes how easily members of the farm sector can convert assets to cash in order to meet short term debt obligations. One measure of liquidity is working capital, which is the difference between current assets like cash and inventory, and short term debt. Higher working capital means much better financial health for the farm sector. The USDA Economic Research Service expects working capital to shrink to $48 billion by the end of this year. The lower amount of working capital is a result of a reduction in assets values ($87 billion lower since 2012), and growing current debt, which is up $30 billion since 2012. Even though working capital is lower since the ERS started tracking it in 2012, the decline followed record highs in net cash farm income from 2011 to 2013. Farm solvency ratios measure whether debt can be met in a timely manner, and the current ratio is favorable compared to the last 25 years. But solvency has been weakening over the last five years, and combined with lower working capital, reflects a modest increase in risk across the farm sector. President Donald Trump signed an executive order today (Tuesday) to do away with the Waters of the U.S. Rule. The American Farm Bureau called it a welcome relief to farmers and ranchers across the country. “The flawed WOTUS rule has proven to be nothing more than a federal land grab,” says Farm Bureau President Zippy Duvall, “aimed at telling farmers and ranchers how to run their business. The Environmental Protection Agency failed to listen to farmers and ranchers when they drafted the rule and caused widespread confusion for agriculture.” However, Politico’s Morning Agriculture Report points out that the executive order may not have a big effect right away. An appeals court put WOTUS on hold while legal challenges are played out. Also, actually withdrawing the rule would require the agency to go through the formal rulemaking process once again. That includes another proposal, notice, and comment period, and then a final rule. Environmental groups still support the rule and would certainly mount a legal challenge against getting rid of the WOTUS rule. The American Feed Industry Association welcomes Wilbur Ross as the new Secretary of Commerce in the Trump Administration. AFIA announced its intention to work closely with the Department of Commerce moving forward on things like trade efforts, including animal food, which fall under the Department’s authority. The association will also support the new Secretary in the promotion and enforcement of laws regarding fair trade and open markets for U.S. commerce. “International trade offers the greatest potential for the U.S. animal food industry’s future growth,” says AFIA President and CEO Joel Newman. “In 2016, our industry’s exports exceeded $11 billion in feed, feed ingredients, and pet food. It’s important for Secretary Ross to understand that overseas markets are the key for continued development and success of the U.S. feed industry.” The association says it looks forward to working with Secretary Ross, and the secretary of agriculture, to ensure the international trade needs, concerns and interests of the U.S. feed industry are represented and taken into consideration in broader administrative trade policy strategies led by the Commerce Department.